Hitherto governed by the PIL-Code of 1978, the Austrian contract conflicts law now follows the uniform European rules of the “(Rome) Convention On The Law Applicable To Con tractual Obli gations” which entered into force with December 1, 1998. This change and the conse quences following therefrom for trans-border legal relationships are the contents of this book. 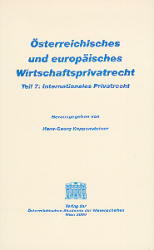 It reflects – after introductory conceptual clarifications – the position of contract con flicts law within the domestic PIL system and explains the bases, possibilities, and the concrete implementation of the Austrian accession to the Rome Convention. The main part of the study is dedicated to concept and contents of the Convention itself as seen from an Austrian point of view. While analyzing the new rules in comparison to the respective former provisions of the PIL-Code, the book meets the demands of legal practitioners by giving particular regard to the relevant case-law of Austrian as well as other Member States’ courts.